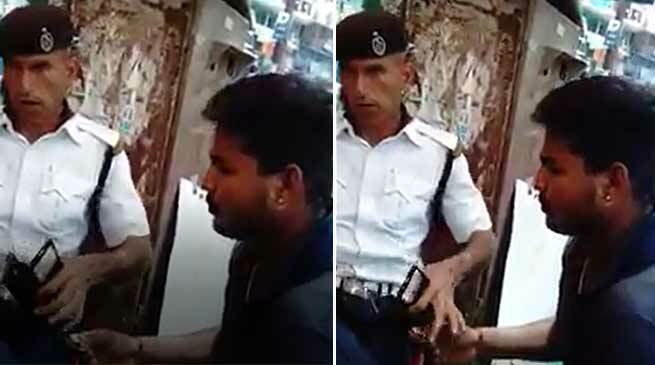 Capital police suspended a traffic constable after a video went viral in social media where the constable is seen taking bribe. There is a video circulating in which one traffic constable is seen taking money after a brief conversation. We have taken strong exception to the same, said Capital M Harshavardhan. The constable has been identified and has been placed under suspension, and departmental Enquiry has also been initiated against him, the SP informed. His action should be seen as an exception and not be used as a pretext to smear the hard work done by traffic police personnel and traffic wardens every day, even in adverse conditions, SP added. Crore Rupaiya lutne bala ko toh kuch karte nai Waise…Sahi kiya suspend kar ke main hota to…Kya karta khud bhi pata nai..
Do you think that there has ever been a single traffic constable in India who has not been found accepting bribe by somebody or other, some where or other, sometime or other? Poor guy, became a news. What about the netas? Caught on camera accepting lacs yet roaming free with all their limitless privileges. Shame on media. First resolve the cases of netas, buerocrats, the other high ups (so called dignitaries) and then look down to a constable. Don’t you know that there is a share of their bosses from his collection?